Ajmer pronunciation ▶ (Hindi: अजमेर /ədʒmeːr/) is a city in Ajmer District in India's Rajasthan state. The city gave its name to the district including it, also to a former province of British India called Ajmer-Merwara. Prithviraj Chauhan founded Ajmer (Ajaya-meru in Sanskrit) in the late seventh century C.E. as the capital of the Chauhan dynasty. The city fell to Muhammad of Ghor in 1193 who founded the Delhi Sultanate. Emperor Akbar brought the Ajmer under Mughal control in 1559 until 1770 when the Marathas took control. In 1818, the Marathas sold Ajmer to the British East India Company, inaugurating an era under British control until independence in 1947. After India's independence, Ajmer-Merwara jointed the state of Ajmer until 1956, when it merged into Rajasthan state. Ajmer, a city know for its beauty, sits with the Aravali mountains surrounding it on all sides. It hosts numerous important religious, cultural and historical sites, Pushkar and the tomb of Muslim Sufi Saint Moinuddin Chishti foremost among them. Other important sites include: Adhai-din-ka-jhonpra, a Jain temple converted into a mosque; Magazine, the residence of Prince Salim, son of Emperor Akbar, that serves as a museum of Mughal artifacts; Taragarh Hill Fort, one of the oldest hills forts in the world; and Anasagar Lake, constructed by King Anaji (1135-1150 C.E.). Mayo College in Ajmer had been founded by the British Raj modeled on an English public school. Raja Ajai Pal Chauhan founded Ajmer (Ajaya-meru in Sanskrit) in the late seventh century C.E.. He established the Chauhan dynasty which continued to rule the country during the period waves of Turkish invaders swept across India. Muhammad of Ghor, founder of the Delhi Sultanate, conquered Ajmer in 1193. He established Ajmer as a tributary, requiring the Chauhan rulers to pay him an enormous annual tribute. Ajmer remained feudatory to Delhi until 1365, when the ruler of Mewar conquered it. In 1509, Maharajas of Mewar and Marwar contended for control Ajmer, Marwar ultimately conquered, emerging as the victor in 1532. Emperor Akbar, ruler of the Mughal, conquered Ajmer in 1559 remaining in the control of the Mughals, with occasional revolts, until 1770 C.E., until it ceded to the Marathas. From 1770 C.E. until 1818, Ajmer became the scene of an ongoing struggle, seized variously by the Mewar and the Marwar Maharajas, from whom the Marathas often retook the city. In 1818 C.E., the Marathas sold Ajmer to the British East India Company for 50,000 rupees. Ajmer enjoyed a stable governance during the era of British rule, even though during the Indian Mutiny of 1857 some Indian sepoys at the garrison in the nearby town of Nasirabad joined the revolt. In the British Raj, Ajmer was governed by an Agent to the Governor General [AGG] overseeing Rajputana. After India gained its independence from Great Britain in 1947, Ajmer retained its position as a centrally administrated state under a Chief Commissioner for a number of years. 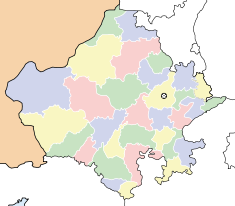 Ajmer eventually merged into the state of Rasjasthan. Pushkar, and the Dargah, tomb of the most revered Muslim sufi saint Moinuddin Chishti, the Gharib Nawaz, stand out as the most important historical sites in Ajmer. Pushkar, a town in the state of Rajasthan in India, about 23 kilometers (14 mi) from Ajmer, is an important historical site with splendid natural beauty. 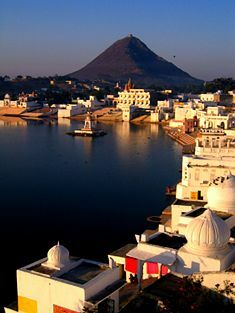 Pushkar boasts Pushkar Lake and a fourteenth century Hindu temple to Brahma, God as the Creator of all creation. That constitutes the only temple dedicated Brahma in the world. 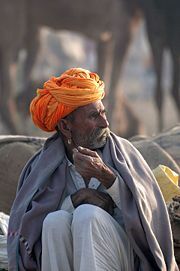 Pushkar has won renown for its annual Camel Fair. The Dargah Shareef of Khwaja Moinuddin Chishti, situated at the foot of the Taragarh hill, hosts white marble buildings arranged in two courtyards. The site includes a massive gate donated by the Nizam of Hyderabad, a mosque donated by the Mughal emperor Shah Jahan, the Akbari Masjid, and the domed tomb of the saint.Emperor Akbar made a pilgrimage on foot from Agra with his queen, every year in observance of a vow he had made when praying for a son. The large pillars, erected at intervals of 2 miles (3.2 km) the entire distance between Agra and Ajmer marking the daily halting places of the royal pilgrims, still stand. The Adhai-din-ka-jhonpra, a Jain temple constructed in 1153 C.E. and converted into a mosque by Qutubuddin Aibak after 1193, sits on the lower slope of Taragarh hill. With the exception a remnant of the temple used as a mosque, the ancient temple has fallen into ruins. Still, architectural and sculpture relics of exceptional beauty remain. Forty columns, each unique, support the roof. The craftsmanship in sculpting the columns reveals the advanced state of Jain skill. Magazine, the city's Museum, was once the residence of Prince Salim (1569 - 1627), son of Mughal Emperor Akbar, and presently houses a collection of the Mughal and Rajput armor and sculptures. Salim's residence has historical significance because Salim, as Emperor Jahangir, read out the firman for trade to India to the British East India Company from here, thus starting the chain of events that led to India's colonization by the British. Taragarh Fort, seat of the Chauhan rulers, may have been the first hill fort of Asia, built at a time when the Aravalli mountain ranges lay above the snow line. The fort numbers among the oldest hill forts of the world, and it stands as the oldest among the hill forts in India. It crowns the summit of Taragarh hill overlooking Ajmer, the lofty thick battlements of which run along its brow and enclose the table-land. The walls stand 2 miles (3.2 km) in circumference. The fort may be approach only over steep and rough paved planes, covered by the fort, and by a hill to the west. The British Raj, gaining control of the fort, had it dismantled by order of Lord William Bentinck, converting it into a sanatorium for the troops stationed at the British cantonment town of Nasirabad. King Anaji (1135-1150 C.E. ), the grandfather of Prithvi Raj Chauhan constructed Anasagar Lake Ton a picturesque site located to the north of Ajmer. The Daulat Bagh Gardens, created by Emperor Jehangir, sit next to the lake set up by Shahjahan added the Baradari (marble pavilion) to the lake side complex. An embankment built between two hillocks—Bajrang Garh and Khobra Bherun (named after the Hindu temples built on them)—created the Lake. Lord Mayo, Viceroy of India Mayo College established in 1875. The architecture of the school buildings presents an example the grandeur of erstwhile princely Rajasthan. The main building of the school, in white marble, provides a classic example of Indo-Saracenic architecture, and the design now lies in the archives of the British Museum in London. The Cathedral of the Immaculate Conception is the seat of the Roman Catholic Diocese of Ajmer. Ajmer is at a major railway junction with broad guage lines to Jaipur and Marwar, Ahmedabad and Mumbai onwards to Bangalore and a meter guage line, scheduled for conversion under Project Unigauge, to Udaipur. The railway complex includes a major workshop. The railway has enabled the city to emerge as a trade center for manufactured goods including wool textiles, hosiery, shoes, soap, and pharmaceuticals. Poultry farming provides a major source of income for the urban farmers. The nearby town of Kishangarh stands as one of the largest markets for marble and marble products. The national highway connects Ajmer with the rest of the region and the Swai Mansingh international airport at Jaipur is 135 kilometers (84 mi) from Ajmer. Ajmer is the home for Mayo College, founded by the British Raj in 1870 to educate the children of Rajputana's nobles along the lines of an English public school. Ajmer is also home to the prestigious Sophia Girls' School, Sophia College, and the historic Ajmer Music College, founded in 1942, the first accredited institution in Rajputana for teaching classical Hindustani music. Other educational institutions which existed in Ajmer before India became independent include: the Government College, Savitri Girls' School & College, D.A.V. College, Government High School, St. Mary's Convent Girls' School, King George Royal Indian Military School, St. Paul's School, St. Anslem's High School, Moinia Islamia High School, Oswal Jain High School, Husband Memorial High School, Govt. Central Girls' High School, Arya Putri Pathshala, and Saraswati Balika Vidyalaya. The Board of Education was, and still is, located in Ajmer. Among the other accredited institutions currently in Ajmer include e one of the four national NCERT Demonstration Schools, Maharishi Dayanand Saraswati University, Ajmer Medical College, Government Engineering College, Maheshwari Public School and Ajmer Institute of Technology. As of 2001 India census, Ajmer had a population of 485,197. Males constitute 52 percent of the population and females 48 percent. Ajmer has an average literacy rate of 74 percent, higher than the national average of 59.5 percent; with 56 percent of the males and 44 percent of females literate. Twelve percent of the population is under six years of age. ↑ Trudy Ring, Robert M. Salkin, and Sharon La Boda. International dictionary of historic places. (Chicago: Fitzroy Dearborn Publishers, 1994), 20. ↑ Rashtriya sahara 5 (7-12)(1993): 78 (New Delhi: Sahara India Mass Communication). ↑ Griselda Pollock and Victoria Turvey-Sauron. The sacred and the feminine: Imagination and sexual difference. (New encounters: arts, cultures, concepts.) (London: I B Tauris & Co Ltd., 2008), 79. ↑ Hugh Chisholm. The Encyclopædia Britannica: a Dictionary of arts, sciences, literature and general information. (Cambridge, England: At the University Press, 1910), 452. ↑ G. N. Sharma. Glories of Mewar. (Agra: Shiva Lal Agarwala & Co., 1974), 80. ↑ Main Building Architecture: Official website of Mayo College, Ajmer, India. Retrieved January 21, 2009. ↑ David Stott and Matt Barrett. Footprint Rajasthan. (Bath: Footprint, 2007), 177. Pollock, Griselda, and Victoria Turvey-Sauron. 2008. The sacred and the feminine: Imagination and sexual difference. New encounters: arts, cultures, concepts. London: I B Tauris & Co Ltd. ISBN 9781845115210. Rashtriya sahara (newspaper). 1993. New Delhi: Sahara India Mass Communication. OCLC 29930146. Ring, Trudy, Robert M. Salkin, and Sharon La Boda. 1994. International Dictionary of historic places. Chicago: Fitzroy Dearborn Publishers. ISBN 9781884964046. Sharma, G. N. 1974. Glories of Mewar. Agra: Shiva Lal Agarwala & Co. OCLC 10780971. Stott, David, and Matt Barrett. 2007. Footprint Rajasthan. Bath (UK): Footprint. ISBN 9781906098070. This page was last modified on 13 February 2019, at 16:50.